Investors sometimes assume book value is the sum of all the money they’ve put into their account. This common misconception often leads people to wrongly conclude that their portfolio hasn’t grown. Over time, your book value increases even if you don’t add money to your portfolio. In addition to all your purchases and withdrawals, book value includes reinvested income from bond coupons, stock dividends, and gains from selling investments within a fund (often, these are collectively referred to as distributions). For Steadyhand investors, book value also includes the fee rebates you receive when you have more than $100,000 with us or have been a client for more than five years. Here’s the kicker: book value is totally irrelevant for many investors. In only serves a purpose if you have taxable investment accounts, also referred to as non-registered accounts. Anytime you sell something in a taxable account, the Canada Revenue Agency (CRA) requires you to pay taxes on the difference between your market value and book value. So, if you sold an investment for $10 with a book value of $9, you owe taxes on the $1 gain. But you don’t need to worry about that in registered accounts like RRSPs and TFSAs because these accounts are tax-exempt (in an RRSP, you’ll be taxed when start withdrawing money in retirement). You can see why comparing your portfolio’s current value to its book value isn’t appropriate to gauge how your investments have done. 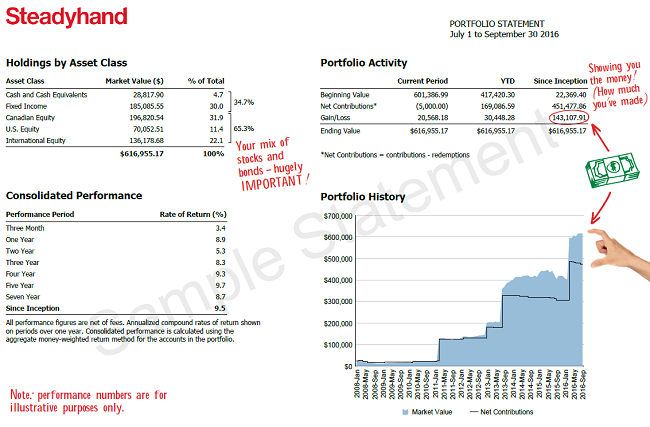 Instead, you should refer to your Steadyhand client statement under Portfolio Activity (see below). The gain/loss row will tell you exactly how much your portfolio has grown in the most recent quarter, year, and since you’ve became a Steadyhand client. We also show you the same information in a graph (Portfolio History) and in percentage terms (Consolidated Performance). If you’re having trouble finding the information, give us a shout. We’d be happy to walk you through your statement.